While the existence of a senior housing bubble is still questionable, experts say the market is becoming different in two key ways: operators either own one or two facilities or are drastically and aggressively growing their portfolios. And the latter strategy is a must for senior living providers who want to remain in the industry for years to come, said Jeremy Stroiman, co-owner and CEO of Evans Senior Investments, during a webinar Wednesday. Portfolio growth will not only help if one facility has a bad year, but it will also help to save costs overall. For example, a provider might pay $800,000 in food costs for an eight-facility portfolio, therefore paying $100,000 for each facility within the portfolio. A standalone facility however might pay $140,000 in food costs — or 40% more than the operator who is paying for each facility within the portfolio. Essentially, a portfolio versus single facility provides more bang for the buck. “The difference between owning one facility versus 10 is mind blowing,” he said. The acquisition market is “ridiculously hot,” Stroiman said, noting that current low interest rates, cap rates trending downward, increases in unit pricing and occupancy gains all point to the present as the time to sell or grow. “Mergers and acquisitions are the key growth strategy for the senior housing and care industry,” he said, noting that 67% of providers have said their primary strategy for growth in the next year is to buy or merge with existing properties or operators. 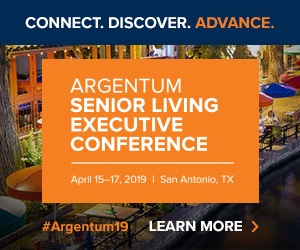 High merger and acquisition activity is also being driven by new players in the space, such as from the multifamily sector, which perceives low risk in senior housing. The silver tsunami is also attracting outside interest to the space. The average cap rate declined 8.7% in 2013 to 8% for the four quarters ending June 30 for senior housing, meaning that property values have increased. In addition, the average occupancy for senior housing nationwide is 90.3%, he said, adding that providers should strive to meet or be above the current average. And new development remains subdued for the time being, meaning that “senior housing as a whole still has a ton of room to grow within existing facilities,” he said. For those looking to sell, having financial records, occupancy/census records and all other expenditures in order is crucial to attract the right buyer. Keeping a clean financial record means it is CPA reviewed and statements can be easily exported to Excel or another template. The more detailed the better — and monthly occupancy/census records are also a good idea. Ultimately, before making a decision to sell or grow, operators need to know what their business is worth, he said, noting the importance of strategy in moving forward.